Navy Hero Hated Seeing Elephants Die. So He Did Something About It. They've dedicated their lives to bravely serving our country. And now, veterans have an opportunity to apply their skills and dedication to a whole new task: saving elephants and rhinos from extinction. Elephants DC had the pleasure of recently speaking to Navy veteran Lucas Bean, who's planning to spend the entire weekend of October 3 and 4 marching for elephants. On Oct. 3, Lucas has organized a 20-mile ruck march along the C&O; Canal outside of Washington, DC. On Oct. 4, he'll be joining thousands of others worldwide to march for elephants, by participating in the third annual International March for Elephants in DC. Lucas has a lot of powerful ideas for how veterans can make a difference for elephants and rhinos. Now living in Baltimore, MD, Lucas served in the Navy for nine years, before being medically retired as a petty officer first class in 2012. Specializing in cryptology and cyber defense, Lucas supported Navy SEAL teams, among other vital tasks. "I don't like seeing extinction"
Of course we had to ask. What motivates someone with an impressive background like that to get involved with helping elephants? "I've always been a huge animal lover," says Lucas. He and his wife care for a dog and five rescue cats, including one with special needs. Once Lucas began learning more about the elephant crisis about a year ago, he was very troubled by the cruelty of poaching and the absurdity of the ivory trade. "There's something really disturbing to me about seeing somebody who kills and just takes a piece of an animal and leaves the rest of it," says Lucas. "And people's desire for ivory and rhino horn is based on so much misinformation. You're killing an animal for no reason." As a veteran with a long history of protecting our national security, Lucas is also deeply concerned by the distinct ties between poaching and terrorism. "People are using money from ivory to purchase weapons for terrorist attacks," says Lucas. He points out that the illegal money of the ivory and rhino horn trade is also tied to other illegal markets, including narcotics and weapons trafficking. 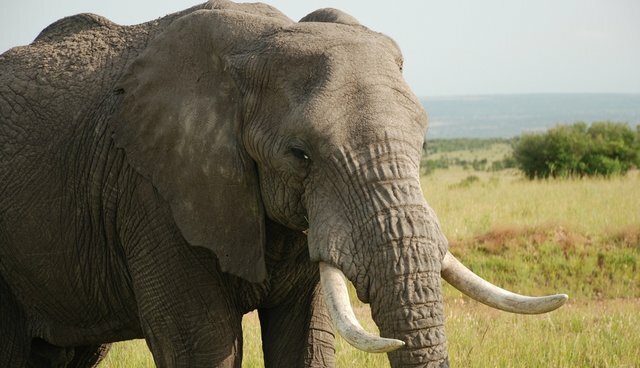 And with elephants facing extinction in the wild in as little as a decade, Lucas warns against the loss of biodiversity we'd suffer if we lost all our elephants, along with a more personal effect. "I don't like seeing extinction. 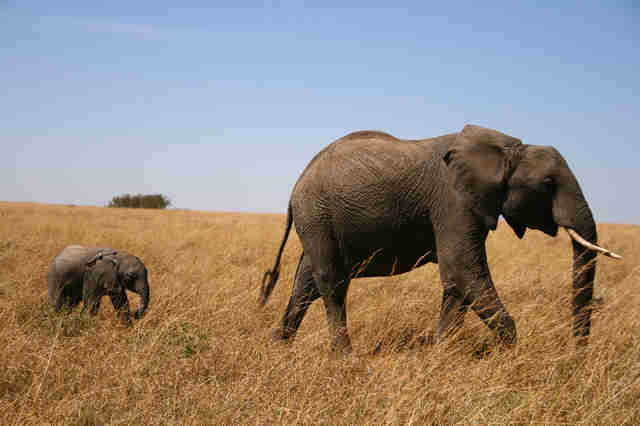 If I have kids, I want them to be able to see elephants in the wild," he says. Maybe most of all, Lucas has been moved by the work of anti-poaching rangers, who risk their lives in the field every day to save animals' lives. He describes seeing a photo of a ranger comforting an orphaned baby elephant, whose mother was slaughtered by poachers, and knowing then that he had to help. It's this connection with rangers that has motivated him to organize his ruck march on Oct. 3. Marching like rangers, for rangers. For Lucas's 20-mile ruck march, he and his companions will be loading up backpacks with 30-plus pounds of gear (or in Lucas's case, canned goods, which he'll later donate to a food bank) and marching military-style to raise awareness and funds for rangers on the ground. "Ruck marches are how we move stuff in the military," says Lucas. "We're glorified pack mules," he adds with a laugh. "But it occurred to me that a lot of rangers in Africa carry their gear that way, too. They patrol, the same as we did in the military. So why not show support by showing some solidarity with what they're doing." In partnership with a nonprofit called Different Rhythm, Lucas is marching to support the Gallmann Conservancy in Kenya. He plans to use funds raised to buy the supplies that rangers desperately need and have trouble acquiring, including communications equipment such as radios, as well as water bladders, uniforms, ruck sacks, and so on. For anyone interested, Lucas says the ruck march is open to anyone who wants to participate. Find out how to contact and join him and learn more here. Changing our view of what veterans can bring to the table. Beyond the ruck march, Lucas's wider goal includes expanding our perceptions of how veterans can make a difference in this cause. "Right now there's a big misconception that people have about veterans, that the only thing we're trained to do is shoot, run and try not to get shot," says Lucas. "But the reality is that all of us in the military received a great deal of training in tons of different things." Lucas believes that all of the skills veterans learn - which vary widely from diesel mechanics, aircraft repair, water purification, radio communications, and many many more - can be of great value to helping save elephants and rhinos in Africa. "I think there's a lot of people who just view veterans doing anti-poaching work as guys who are trigger-pullers, who want to act like cowboys," says Lucas. But they have so much else to offer. "How about water purification?" he asks. "Do you need me to put up fence posts?" The options are unlimited for veterans' involvement, with the right attitude. And more importantly, Lucas believes the interest is there, and that there are many veterans who would help more, if they could. For anyone, veteran or not, who wants to help save elephants and rhinos, Lucas advises, "Start where you can." You don't have to go Africa to make a difference. He recommends contacting his affiliated organization, Different Rhythm, as a potential starting point for more involvement. If you care about saving elephants, fighting terrorism and preventing extinction too, follow Lucas's example and take a stand. On the weekend of Oct. 3 and 4, 2015, tens of thousands of marchers will be taking the streets worldwide through the Global March for Elephants and Rhinos. If you're near Washington, DC, join us at the Third Annual International March for Elephants on Sunday, Oct. 4. Or you can find a list of other cities with marches happening that weekend here. 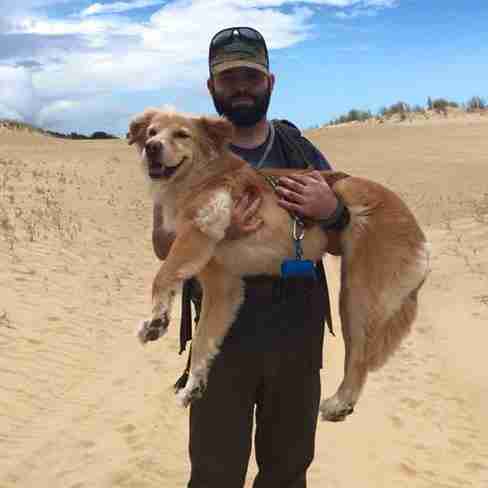 Thank you, Lucas, for your service and your leadership in connecting veterans with the fight against extinction!